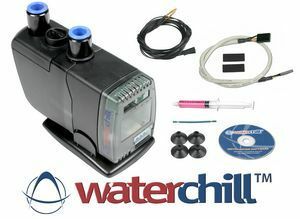 The auxiliary temperature connector on the New generation ChillControl and WaterChill Mag Drive 12VDC USB Pump can be utilized to monitor a second specific or general system temperature on the ChillControl display mounted in the front bezel, LCD or through software. 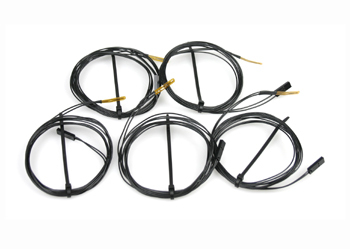 By placing this extra (optional) temperature sensor in free space inside the case, in a specific case section, or directly onto a specific HW component the end user can monitor the heat dissipation and heat build up during various system load scenarios. 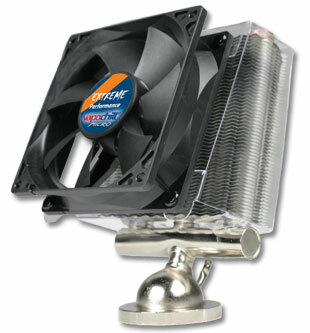 Up to 5 extra temperature sensors and 4 extra fans can easily be connected to the ChillControl. E.g. a sensor can be placed on the VGA or on your water-cooling parts and if any heating problems are detected a signal will be given to the ChillControl and a safe shutdown feature will be initiated immediately. Ex. : A sensor can be placed on the VGA or on your water-cooling parts and if any heating problems are detected a signal will be given to the ChillControl and a safe shutdown feature will be initiated immediately.